We’ve recently released our Glamping Business Course with Inspired Courses, which will look at some of the essential elements of what works for the deluxe camping industry, and what you would have to think about if you wanted to do something similar. It includes everything you need to know about starting up a glamping business of your own. We’ve also been chatting to Sharon from The Happy Caravan who has already started her dream glamping business. So we caught up with her to talk about the inspirations for her work and what hurdles she’s had to overcome to bring the successes she’s achieved so far. She’s even shared some of her secrets of how to paint a vintage caravan, so if you already have one that needs a bit of love and attention then make sure you make the most of Sharon’s expert advice. If you want to source some cheap vintage caravans for sale, then take a look at our tips and tricks in this article on Inspired Camping. From a very young age I have been on caravan holidays with my Sister and Parents, mostly in the UK but also France, I have many happy memories! With a young family of our own my Hubby and I would often stay in cottages near the sea in Cornwall and then one day I was driving past a caravan sales centre with my parents and children (Hubby was at work) and felt a natural urge to take a look! From the minute I stepped inside the 1993 Mardon I was hooked, memories and smells of caravans came flooding back and my kids just loved it. Fortunately my Dad (being my Dad) did a deal (Husband on the end of the phone) and that was it I have never looked back. 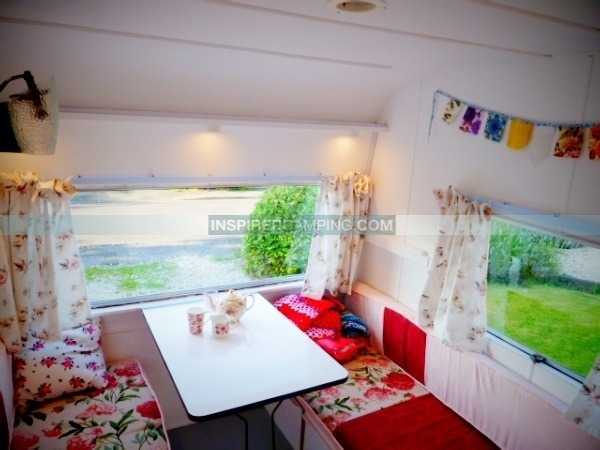 So far as working with vintage caravans for a living that came about a little later, I loved the Mardon even though it was ugly and the interior all green velour and brown carpet. I set about a little makeover, why not; surely it couldn’t be too hard to do? Little changes here and there. I inherited simple sewing skills from my Mum (which have improved vastly since then… thanks Mum! 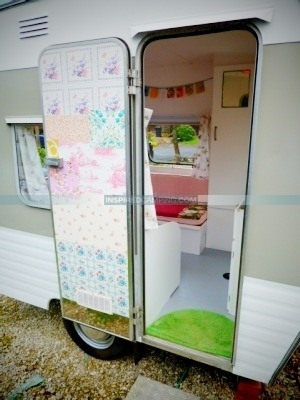 ), so set about changing the seat covers and curtains and voila she was transformed. When on a weekend break with my cousin and her family in my newly revamped Mardon I awoke one morning to peek out of the window at the most beautiful thing I had ever seen. I didn’t know at the time but it was a Car Cruiser! I couldn’t wait to get in it! 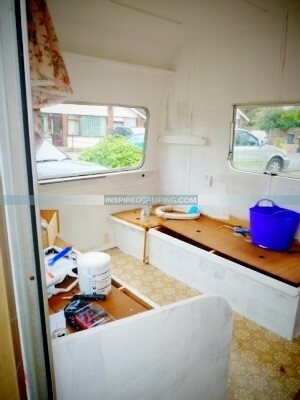 The owners had just bought her to take to shows and she had all original hob and sink etc. I thought… ‘I HAVE TO HAVE ONE!’, much to my cousins disgust and my Husbands raised eyebrows. Needless to say the Mardon was quickly sold and in its place has been a succession of vintage vans! I just knew it was right and that the combination of vintage beauty and curves with a scrubbed and painted interior with new curtains was perfect for me and was my home from home. We are now a little team. I do most of the work but my Hubby does a lot at weekends and evening (electrics, etc) and My Dad has been a wealth of knowledge over the years. He is an engineer and also spent some time working for Lunar caravans and it does help that he’s very enthusiastic in his retirement! My Mum provides sewing and interiors advice and my little Sister even shops for vintage fabrics for me! When I first began working with vintage caravans they weren’t very popular so very few came up on eBay, but now there are a lot more being advertised. However, with this increase in supply also comes the increase in price to match their new demand. 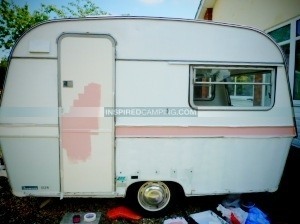 Restoring vintage caravans is an adventure every time and I never know how long each one will take until the end. It entirely depends on what we find as we work, and the condition of the van when we first buy it. If for example the van doesn’t have any electric that takes up more time. The size or sleeping capacity also means a lot more sewing and painting! I did a bespoke five berth for a family, which was quite a big van and did take up a lot of time. 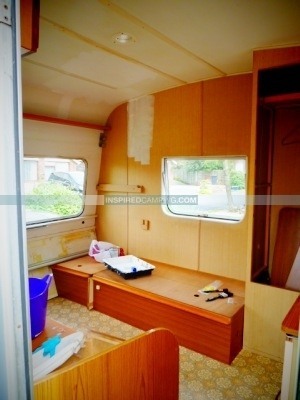 If the van is say a two berth with electrics and in a reasonable condition I can turn one out in about a month. It’s very tempting to keep the caravans I improve. In fact I would keep them all if I could! I have kept several for a while even using them on occasion but then I get itchy feet to do another! It does help that we are experienced caravaners though as we give attention to those little things like spotlights, where the TV goes and putting plug sockets in the right place like near a mirror? Easy clean floors are also good! Since I’ve started my glamping business I’ve had a few hurdles to get over, but the main one is that as I love what I do I have to try not to get too attached and to take things too personally. I put my heart into my work – I cannot do my job any other way – but I find it difficult to wear all the different ‘hats’ necessary. Thankfully I have a very supportive hubby and family who soon point me in the right direction and remind me that its my job and not to take it to heart! Using the Internet is essential for my business but I do sometimes get a bit overwhelmed by the amount of information out there and sometimes it’s hard to know what to believe. If there were tips to help me narrow this down then it would be a huge help. For anyone else out there wanting to set up a camping business, my biggest piece of advice for them would be to make sure they take notice of what their market want and value. It’s wise to keep up with trends and maybe try to offer something a little bit different! I was going to conform to the ‘Cath Kidston’ market with the interiors of my vans but decided against it and to stick to a more original vintage and the ‘granny chic’ look, which is more like my true style. This is my unique selling point. The biggest inspiration for my business was the beautiful Car Cruiser I first saw in 2002! However, I’ve also loved craft, interiors and art from when I was a child so this and my love of caravans has pulled it all together to form my business. I still get very excited when I see a great vintage caravan, and my inspiration evolves regularly with my love of the different looks available: thrift; vintage; granny chic, etc. My biggest success with my business so far has been the fact that I am able to earn a living (albeit modest) doing something that I thoroughly enjoy and love… turning around old, pre-loved and forgotten caravans into something that can be used and loved again. It’s one of the best forms of re-cycling and I love my job. You can’t have more success than that can you! When I first started doing this I would stand inside my new purchase and stare! Then look around some more and then some more! I wouldn’t know where to start but eventually the vision of what I wanted would become clear. I look at what I have and what I can recycle, as well as what simply needs to be thrown away. I have used trial and error to find the best techniques and most of them I keep as my own business secrets, but there are some tips I’m willing to share with those who may do me a similar favour of passing on some good will in return. All I ask is you share my glamping business details or talk about what I do to others who might be interested. You can do this easily by clicking the button below to tweet about my article to your Twitter followers. Then I hope you’ll find the tips I’ve shared below useful. This is all very time consuming, but rewarding. However if you want to see fast results then you may just want to paint the interior walls and put a few crochet blankets over seats for speedier results. For more renovation inspirations please see the article about small travel trailers.